Executed in 1976. This work is unique and is accompanied by a certificate of authenticity signed by the artist. The work of Charles Ray continually touches upon a complex network of associations, both personal and public, aesthetic and autobiographical. Untitled (Glass Chair), 1976 represents a decisive period in Ray's artistic development, a moment when he began to solidify some of his ideas and form a mature identity. Executed the year after he graduated from University of Iowa and began graduate studies at the University of Kentucky, this work is one of a group that marks his final decision to pursue sculpture instead of performance art (a choice he had struggled over during the previous years). It was then that Ray began to work with glass, a material that not only enticed him at that moment, but which he has continued to explore to the present day. Untitled (Glass Chair) is a quintessential work from this critical period in his career. Untitled (Glass Chair) is therefore a work of art that directly affects the spectator's experience of space. This relates to the preceding generation of Minimalism, a movement that had to be on the mind of any artist coming of age in the seventies. Theorized by Donald Judd and Robert Morris, Minimal art depended on the phenomenological interaction of the viewer's body with the work of art. This reconfiguration of the role of the spectator, as instigated by the presence of "primary structures" in the gallery space, has had profound influence on artists up to the present day. Ray had already dealt with these ideas earlier, with the famous Plank Piece I-II, 1973, a set of photographs in which the artist himself hangs limply from a plank propped up against a wall. As Schimmel notes, "By inserting his own body into the work, he created an empathy with the viewer that extends beyond formalist concerns" (Schimmel, p.66). And yet, it seems like Ray presented an intentionally over-literal understanding of the calls for a more "interactive" art that permeated the art world in the late 60s and early 70s, creating what may also be read as a parody of those ideas. Hence, Ray's oeuvre sits firmly in the post-Minimalist camp, as he deals with many of the same issues tackled by artists like Eva Hesse and Bruce Nauman. And the lessons of works like Plank Piece and Untitled (Glass Chair) have helped shape Ray's work of the last three decades. Ink Box, 1986, a black box filled to the brim with two hundred gallons of printer's ink, offers another play on the Minimalist aesthetic. Here, the perfectly minimal cube becomes unstable, threatening to spoil the clean white purity of the gallery that contains it, not to mention the visitor to that space. Once again, Ray subverts our expectations by manipulating the tropes of modernist art, investing it with humor and surprise. The engagement with the body and use of materials like glass to disrupt the viewer's relationship to a particular form also relate to Ray's more recent Puzzle Bottle, 1995, in which the artist himself peers out at us from his transparent container. Whereas Untitled (Glass Chair) problematizes our relationship to an everyday object, Puzzle Bottle separates us from the artist himself, a play on the cliché that the work of art contains the "presence" of the artist and his expression. Seen within this context, Untitled (Glass Chair) both looks forward to things to come and displays remnants of Ray's earlier reconfiguration of Minimalist paradigms. 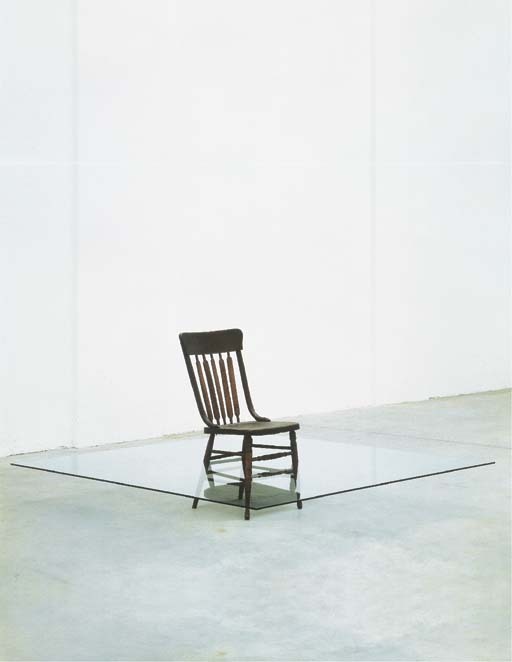 The simple, isolated form of the chair engages the gallery space much like a Judd cube, its Gestalt-like presence a product of its utter banality and recognizability, yet the dauntingly precarious pane of glass actually prevents any intimate interaction with the viewer. In this respect, the work appears somewhat menacing, for while the chair naturally welcomes the viewer to come sit down, this would be a dangerous endeavor indeed. Transformed into a subtly antagonistic object, the chair's original purpose, its very form and function, is thoroughly undermined. What was originally designed specifically to hold the human body is now made hostile toward that same body. And thus it sits, forever captive in its prison of glass.